Most pet owners just never believe that they will lose a pet. But the fact is that dogs, cats, birds, and other pets escape from their owners care all of the time! Here are tips to help reduce the odds that your pet will become lost and increase the odds that he/she will be found should he/she escape from your care. These prevention tips might take twenty bucks and twenty minutes of your time, but it’s worth the investment of time and money to be prepared. 1. COLLECT AND STORE SCENT & DNA In the event your pet becomes lost and you happen to have access to a dog trained to track lost pets, you’ll want to have a sample of your pet’s scent. While wearing a pair of rubber glove, use a sterile gauze pad and wipe your pet’s body – wipe its back, tummy, and mouth. Place the gauze pad inside a plastic bag. Write the date and your pet’s name on the outside of the bag. As long as you are storing scent, you should also keep a sample of your pet’s DNA on hand in case it is needed for making a positive ID. Collect a whisker, a few toenail clippings, and a few hairs that you have pulled from your pet (which include the root of the hair). Shed hairs will not do as you need the root (which contains the DNA). Place all of these and your gauze pad into the bag and stuff the bag into the back of your freezer. If you have multiple pets, make separate bags for each of your pets. 2. COLLAR & TAG (AND CHIP) OK. We know you’ve heard it before but you’re going to hear it again, your pet should always, always, always wear a collar with an ID tag! Even if you never let your dog or cat out of your care, you never know when an emergency will happen and your pet will become lost. A burglar may break into your home, leave the front door open, and allow your dog or cat to escape outside. Paramedics may respond to your home in an emergency and when opening a door, enable your pet to escape. Your pet could become ejected from your car when involved in a traffic accident – this actually happens quite often. We point out these tragic situations because most people never think these are possible but they are – we’ve heard from people who’ve lost their pets in situations just like these who did not put a collar and ID tag on their pet because “I never let my dog out of my care” or “I never let my indoor cat outside.” But dogs that are found wandering with no collar or ID tags are self-adopted by people who don’t know how to find the owners. Even indoor-on ly cats absolutely should wear a collar and ID tag because when they escape outside, they are at risk of ultimately ending up in an animal shelter long after you have stopped searching. If you are worried about your cat choking on a collar, get a breakaway collar or a stretchy cat collar with Velcro that a cat can back out of if it becomes snagged. If you don’t put a collar on your dog because the metal tags create problems with allergies or the noise triggers neighbor dogs to bark, use duct tape to protect the tags or simply write your contact information on a thin piece of paper and wrap it around the collar with clear packing tape. Microchipping your pet is an additional protective measure that can help bring your lost pet back home. 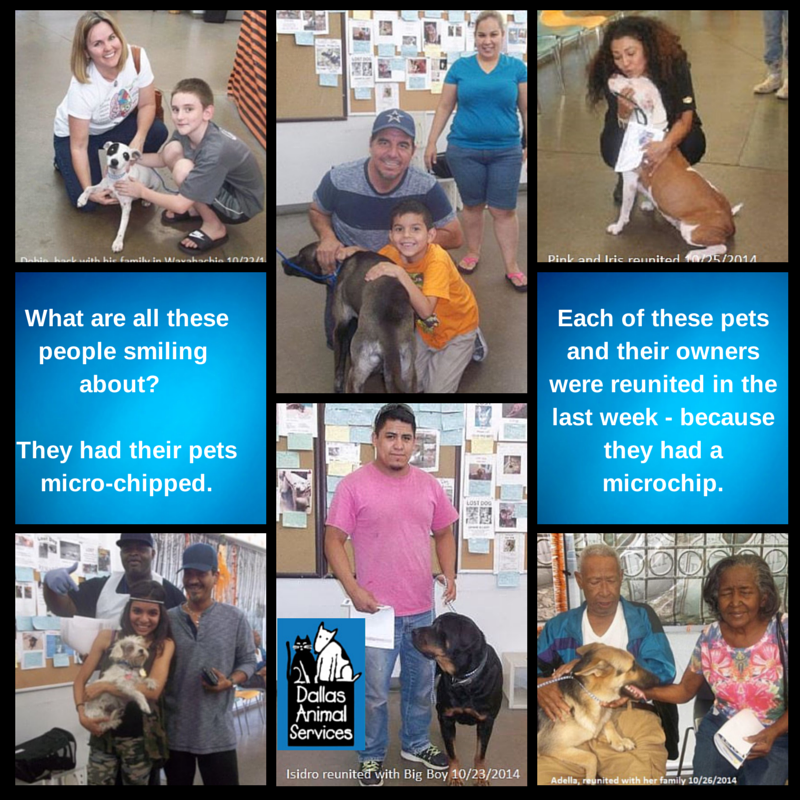 A microchip is a device the size of a grain of rice that is implanted under your pet’s skin. 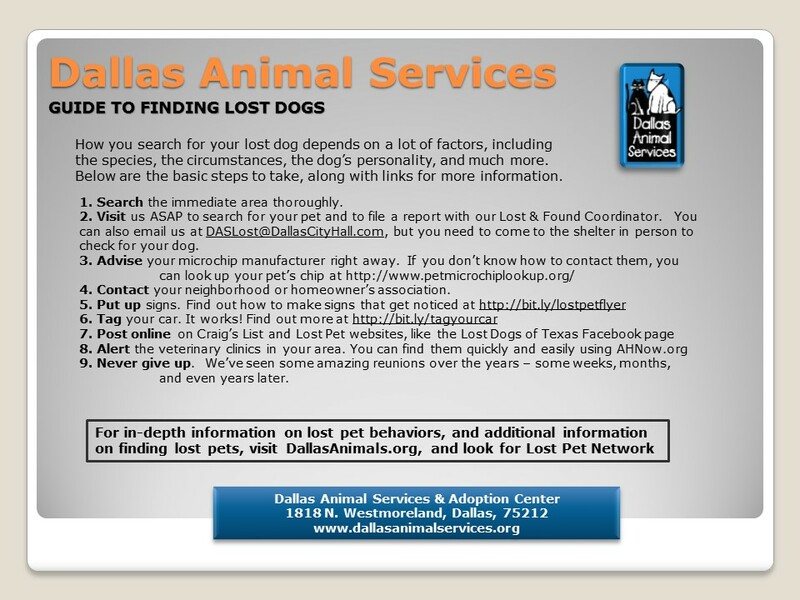 It is detectable with a microchip scanner used by shelters, veterinarians, and rescue groups. Most veterinarians and shelters can microchip your pet for you. 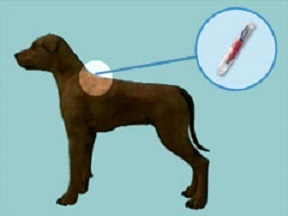 Microchipping is equivalent to implanting a serial number in your pet – serial numbers serve as a means to return property to their rightful owner as well as providing positive proof of ownership should there be a dispute. Sadly, we do a better job of registering, recovering (when lost or stolen), locating, identifying, and returning (to the owner) lost andstolen guns and cars than we do lost or stolen dogs, cats, birds, and other pets. Do your part to increase your odds of a recovery – use a collar, ID tag, and microchip! 3. SAFE TRANSPORTATION This sounds quite basic, but you’d be surprised how many pet owners put their companion animals at risk of becoming lost by careless transportation habits. A dog inside of a car can escape when involved in a traffic accident or it can jump out prematurely when a door is opened. Cat carriers have been known to break open during traffic accidents and on conveyor belts at airports. We’ve had cases where cats have clawed their way out of cardboard carriers or scrambled their way out of their guardian’s arms while being carried into the vet’s office. No matter how crabby your pet becomes with confinement, make sure you transport him/her in a secure carrier! When panicked, a dog can slip right out of a flat collar leaving the owner holding a limp leash attached to a dangling collar as the dog bolts away wearing no form of identification. In addition to always putting a flat collar with ID tags on their dog (which should be worn for identification purposes and not for leash attachment), dog owners should utilize a nonslip collar (also known as a greyhound collar) for leash attachment. These collars literally make it impossible for a dog to back up and slip out of the collar. Even if your dog is trained to come to you, always keep your dog on a leash when in public areas that are unfenced and are near traffic or distractions. Cat owners put their cats at risk of permanent displacement by carrying their cats in their arms when they should utilize a cat carrier. Many cats become panicked when removed from their territory (i.e. your home) and so a simple trip to the vet’s office could involve an experience of your cat scrambling out of your arms (causing significant cuts to your arms and chest) and bolting away. You can avoid these all-too-common escapes simply by purchasing and utilizing a cat carrier (they even come in stylish cloth shoulder bags) whenever transporting your cat. 5. HAVE PHOTOS READY Keep CURRENT photos of your pet on hand (at least 5 of them). Many people take photos of their puppy or kitten but stop as the animal ages. Also, many dogs look very different just before and after their grooming, so have a set of both (before and after pictures) on hand. 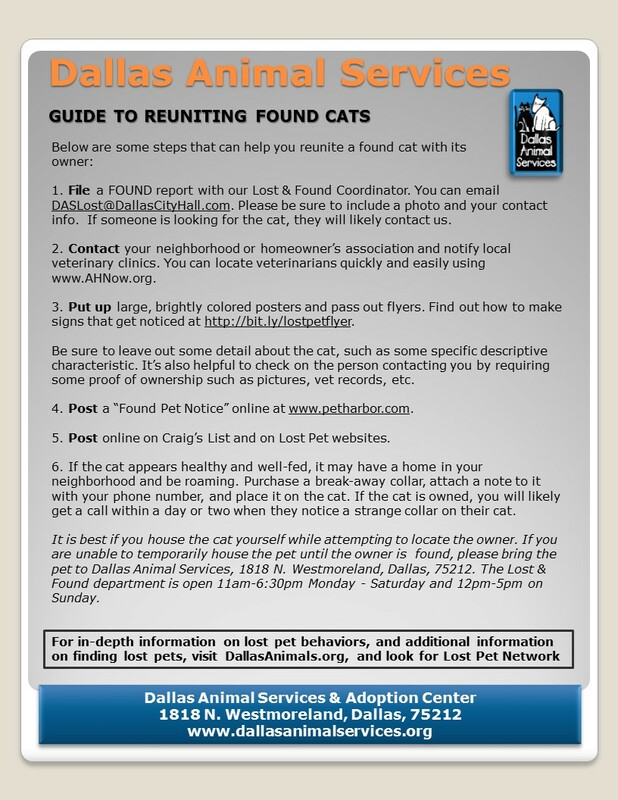 For your posters, use the photo that your dog or cat most resembles at the time they become lost. 6. 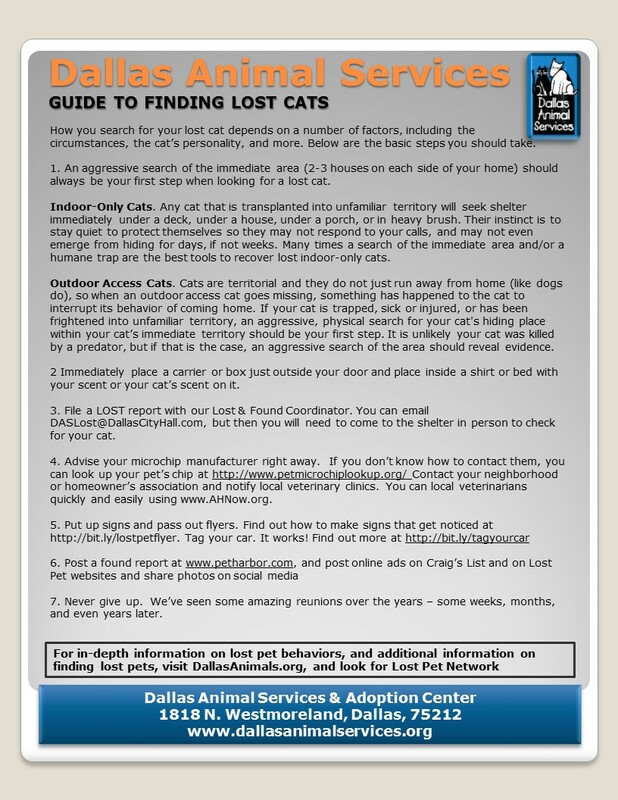 PREPARE A LOST PET KIT Create your lost pets signs as seen on our Posters 5+5+55 page. Have photos and flyers ready, just in case. Keep them stored where they’re easy to get to and be sure to update them when necessary. Hopefully they’ll get dusty and will never be used, but if you need them, they will save you time and stress. 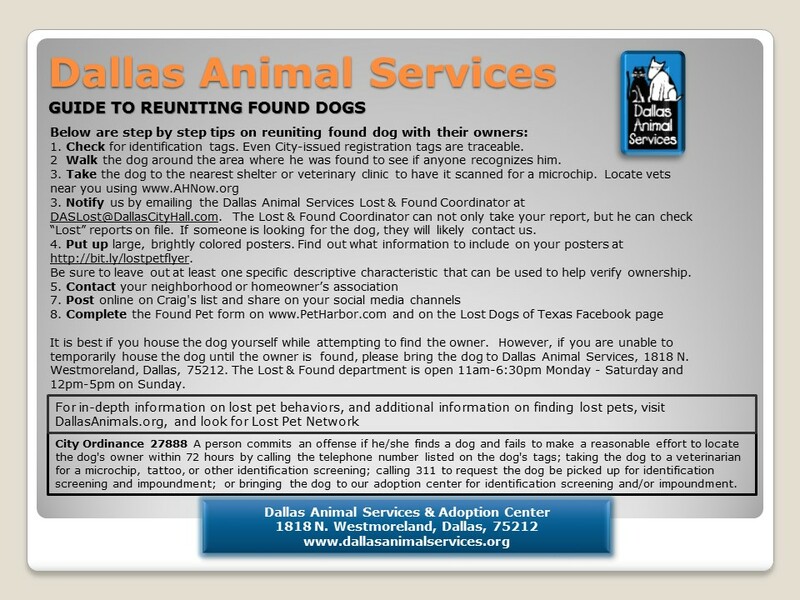 And if you have a friend, family member, or neighbor who happens to lose their pet, you can immediately help by delivering several giant, florescent REWARD LOST DOG or REWARD LOST CAT posters as they quickly create the flyers to place in the center of those posters. 7. PROOF OF OWNERSHIP It is critical that you take steps to demonstrate proof that you own your dog, cat, or other pet. There is no guarantee that the person who finds your pet will be willing to give it back to you. Sadly, there is no guarantee that they will be truthful. If you discover that someone has your dog or cat in his or her possession, you will want to call law enforcement and you will need to have something to show an officer to prove that this animal belongs to you. The best method to show proof of ownership is to have your pet microchipped. Check with your local shelter, rescue groups, and veterinarians to have this simple procedure performed (a shot where a microchip the size of a rice grain is implanted under your pet’s skin). If your pet has any special markings, markings inside their mouth, scars, tattoos, etc., photograph these areas and keep these photos in a special location. 8. KEEP PHOTOS WITH YOUR VET It is a good idea to keep a set of current pet photos with your veterinarian (they can be attached to your pet’s file). This way, your pet’s photo will be available should your home be destroyed (during fire or natural disaster) or if the photos you kept at home become lost or destroyed. 9. NEW YEAR’S AND JULY 4TH MEASURES There are two days of the year when your pet is especially at risk of escaping from your care – New Year’s Eve and Independence Day. That’s because these two days are notorious for repetitive fireworks, firecrackers, gun shots, and other booming noises that can send pets, especially dogs, into a frantic, frenzied panic. Dogs have been known to break out plate-glass windows, chew through doors and fences, push through gates, and climb fences they’ve never tried to climb before. If you’ve adopted a dog or puppy recently and you’ve never seen how it behaves around thunder, gunshots, or fireworks, be cautious with your dog around these two holidays. 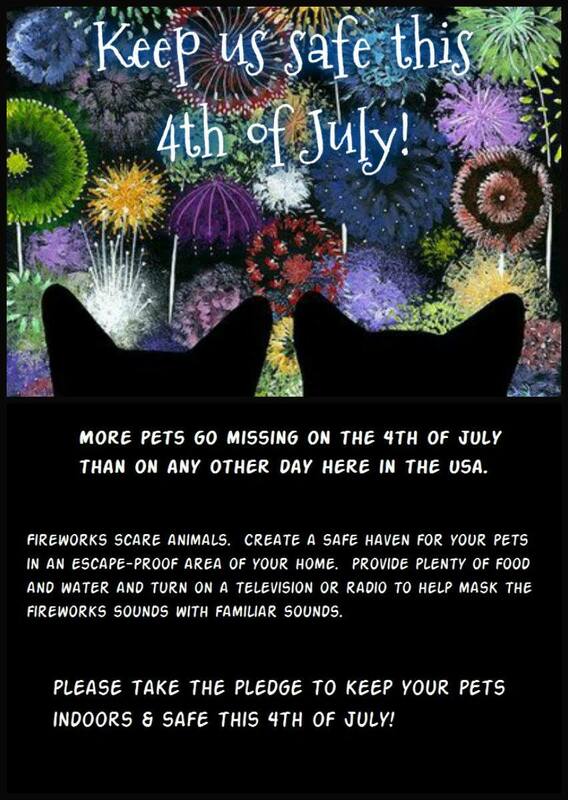 To be on the safe side, crate all pets during the peak fireworks hours on these two holidays and turn on a television or radio so it will drown out all the popping sounds. 10. BE NEIGHBORLY When you’re out walking your dog, or out front with your cat, ferret, turtle, parrot, or other pet, introduce him/her to your neighbors. That way, if this pet escapes and is seen by your neighbors, they will know who it belongs to and will be more likely to rescue and return it to you when they see it. Also, being a good neighbor will increase the chances that your neighbors will be your friends when your pet becomes lost. A barking dog that is a nuisance can create hostility from neighbors who lose sleep. If your dog (or cat) routinely roams and poops on your neighbor’s property, that neighbor will be less likely to help you should that pet disappear. A dog attached by a leash to a pedestrian receives much more respect than one wandering by itself. Be a responsible pet owner! 11. SURVEY YOUR PROPERTY You should secure your yard to make sure your dog, cat, ferret, turtle, or other pet can’t escape through small openings. Get down at your pet’s level and check everything! Push on all boards to see if any are loose. We typically look down at things and don’t see what our pets are able to see. Pets sometimes have all day to look, poke, and dig in their efforts to escape. From their level, they may have found a small hole or a loose board that you can’t see. 12. SECURE YOUR PROPERTY For smaller dogs, put up a small wire fence within the perimeter of your yard to add an additional barrier they would need to cross before digging out or climbing over a fence. For larger dogs, create a higher wire fence inside the perimeter of your yard. For stubborn dogs who attempt to escape, putting up a hotwire might not be a bad idea if it will prevent your dog from escaping and being struck by a car. If and when they touch it, they seldom do it again. Remove items leaning on or resting against your fence that your dog might use to help him/her climb or jump over. Woodpiles, spas, children’s toys, boxes, etc. next to a fence make a great springboard for dogs to jump on and then climb over and take off on a potentially fatal journey. 13. TRAIN YOUR DOG It’s hard to maintain a well-groomed yard and a happy dog unless you’re willing to invest time and money into training. Dogs can be trained to NOT go through open gates or cross borders. This type of training keeps your dog at home, where it belongs. Dogs can also be trained to not rush to or through the front door when the doorbell rings. Hire a dog trainer or behaviorist to help train fence jumpers, door rushers, hole diggers, or dogs who won’t come when they are called. 14. TRAIN YOUR CAT We’re not kidding! Yes, cats can be trained. The training we suggest involves training your cat to enter a baited humane trap. Humane traps are one of the most successful and primary tools that can be used to recover an indoor-only cat that escapes outdoors or a cat that is displaced into unfamiliar territory. If you know that your cat will never be allowed free access outdoors, then we recommend that you teach your cat that humane traps mean food and safety. Simply take a humane trap and prop open the door with a bungee cord or a stick through the trip mechanism so that the door will not close when the cat steps on the trigger plate. Feed the cat inside the humane trap every day so that he enters and leaves without fear. If your cat should ever escape outdoors, you will increase your chances of recovering your cat by setting baited humane traps when your cat associates the traps with food and is not afraid of them. We DO NOT recommend that you train a cat to enter a humane trap if that cat is allowed access outdoors! That is because pest control companies, apartment complex managers, and cat hating neighbors routinely use humane traps to remove cats from private property.